For example, it’s a nice sunny day today. So we could do with me doing a couple of loads of washing. But that means me being around to load and unload the washing machine and then to hang out the wet clothes. This is best done in the morning so there is a good opportunity for the clothes to dry. So I need to stay home this morning. And then I had some messages that several different items that have been ordered online are going to be delivered today. One is a pair of concert tickets I ordered months ago, the other are a couple of items I only ordered yesterday and which were despatched in record time. It is good to receive notifications that these items will be delivered today, but I don’t know when so I have to wait in for both of those to be delivered. And one of them contains a light that will need fixing up outside the house, so that’s another job for the day. If you have read any of my bloggages about deliveries then you will know I have low-level paranoia about this so I have already checked that the doorbell works and that the sign showing where it is is still visible. And then there’s the reason for this photo. 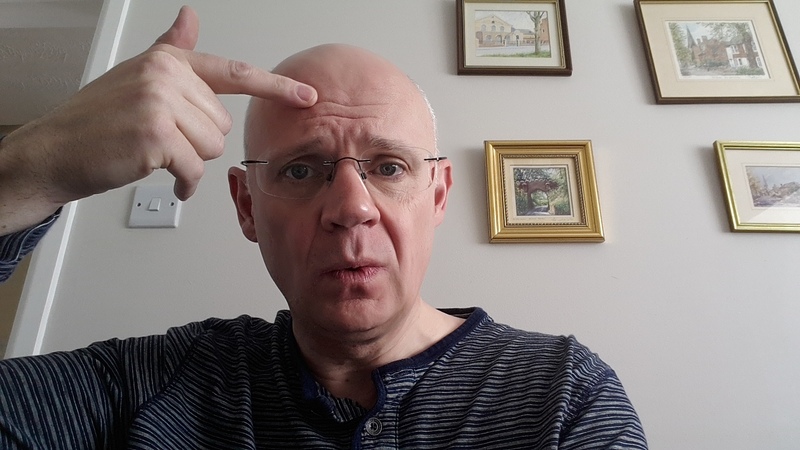 No, I am not intentionally pointing to the frown lines on my head, I am trying to show the mark on my head that was caused by me getting dressed this morning. I bent down to open a drawer in order to get some clothes out and made several misjudgements: (a) how far away I was from the chest of drawers (b) how long my arms were to reach down into the bottom drawer (c) that my head was connected to my torso and when I bent forwards my head would move towards the top of the chest of drawers (d) how dopey I am. I leant forward and down into the bottom drawer but before my hands could reach the clothes I was trying to get my head reached the top of the chest of drawers. It wasn’t a major impact. I am not concussed or in need of a visit to hospital. It was more of a surprise. But for a while there was a noticeable red mark and it may be that a bruise emerges (hypochondriac? me?). The initial red mark was much more noticeable than this photograph shows and it made me wonder about going out today as people might stare at me. The combination of all of these things (coupled with me taking the time to write this bloggage) means that I may well not go out today because of a number of circumstances beyond my control. How often do we have to adjust our plans and ideas because of circumstances beyond our control? Unless you have decided to become a hermit and live a self-sufficient lifestyle in a remote cave somewhere (in which case how have you got internet access to read this?) you will be living in the reality that other people will make an impact on your life. Sometimes that may be negative, other times it may be positive. But we have to respond and react to all of these other people as well as to many other unforeseen events. It has been said that if you want to make God laugh tell him your plans. I think that’s rather a sad parody of how things are. I think God really does want us to share our thoughts, ambitions, plans and hopes with him. But not so he can mock us and hit the ‘smite’ key on is computer. Rather it is with the attitude that as he is God it would be a rather wise thing to consult and involve him in our life. The pattern for prayer that Jesus taught encourages people to pray that God’s will be done on earth as it is in heaven. I believe that if we pray and share our plans with God in that attitude it makes him smile rather than laugh – smile because he delights to work with us to help shape our lives, to walk with us in the tough times and dance with us in the joyful ones. Although there may have been a divine snigger when I banged my head this morning!